German Pinscher Dogs - The German Pinscher is a short coated, medium-sized dog, believed to have been bred in Germany and descended from early European herding and guardian breeds. The German Pinscher is elegant in appearance with a strong square build and moderate body structure, muscular and powerful for endurance and agility. Colors for this breed include black and tan, red, fawn, and blue and tan. Energetic, watchful, alert, agile, fearless, determined, intelligent and loyal, the German Pinscher has the prerequisites to be an excellent watchdog and companion. KD German Pinscher - Florida - Quality purebred German Pinscher with Champion Bloodline. The Pinscher makes an exceptional watch dog & family pet. Located in Melbourne, Florida. 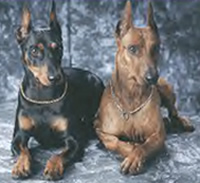 German Pinscher Breeders - Advertise your kennel puppies and dogs here.